4 doorbuster offers that will make you thankful... for TNW Deals! 4 doorbuster offers that will make you thankful… for TNW Deals! Are you one of many Americans celebrating Thanksgiving today? Then you might want to throw a thanks TNW Deals’ way… because we’ve been hooking you up all year long. 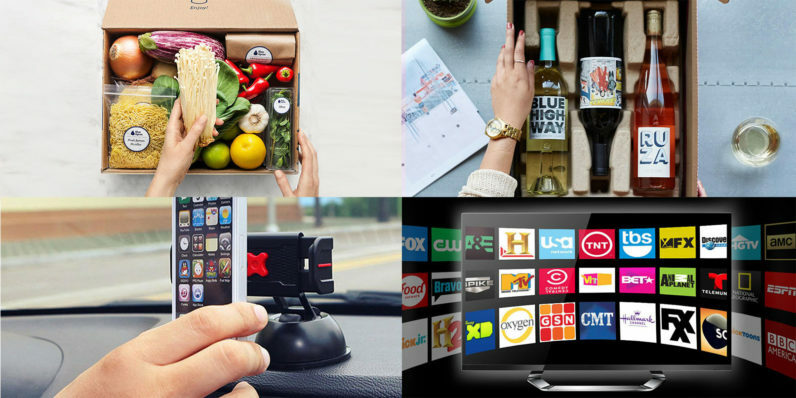 Case in point: These deals we’re offering on an expansive entertainment library, delivered gourmet meals, wine shipped to your door, and a car mount that will prove essential on the road. Your first reason to be thankful? All the streaming content available from SelectTV to keep up with all your watercooler talk. With SelectTV, you’ve got instant access to the world’s largest entertainment library: Over 300,000 TV episodes and 200,000 movies, plus live channels, radio stations, and video on demand from over 150 countries worldwide. Buy now: Get up to 54 percent off a SelectTV subscription, with the option to choose between a one and three year plan. For healthy gourmet meals delivered to your door during all those crazy work weeks… you can thank Blue Apron. Sign up with them, and they’ll ship fresh, pre-portioned ingredients and easy-to-follow recipes directly to you, ready to whip into amazing meals for a fraction of the price of a fancy restaurant meal. Buy now: Get Blue Apron’s three-meal plan for $25 — that’s just over $4 per serving! Or to feed more mouths, opt for the Family Plan for a similar discount. You can also be thankful that you can purchase premium wines at less than $9 a bottle with Winc Wine Delivery. Sign up with Winc, and its experts will determine your particular wine tastes, handpick some of the world’s best wine blends to match those tastes, and ship those bottles directly to you. Top-notch vino with minimum effort — a win-win! Buy now: Pick up three Winc Wine bottles for less than $9 per bottle — just $26 total. Last reason to give thanks? Car mounts that keep you and everyone else on the road safe — namely the ExoMount Touch. This device attaches easily to your dashboard or windshield, and keeps your smartphone securely in place so that you can easily use it hands-free. It’s not just a matter of convenience, but also the best way to avoid a distracted driving accident. Buy now: Grab the ExoMount Touch for just $24.99, marked down from the usual $29.95. And if you’re outside the U.S., you can opt for international delivery at even higher markdowns.